The 101 Sci-Fi Movies currently has me smack-dab in the middle of the 80s and I am loving it, especially when I get to revisit films that send me back down that nostalgia road. I remember watching this John McTiernan film when it came out on the American Naval Base in Bermuda, and then watching it countless times when it hit VHS. 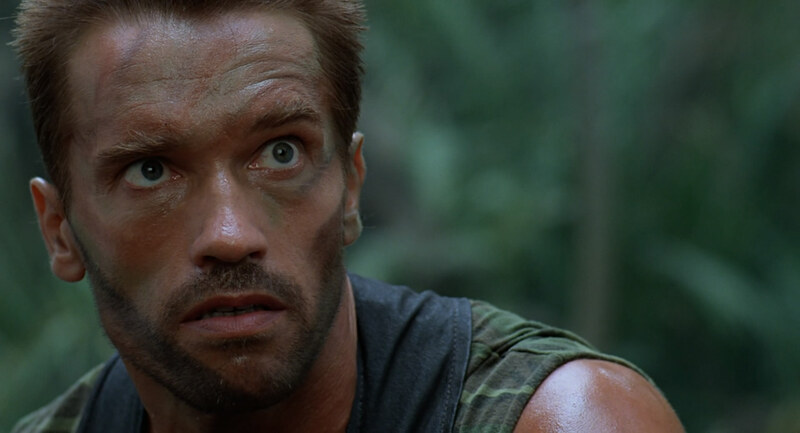 This was a flat, balls-out action movie that saw Arnold Schwarzenegger taking on an alien menace in the jungle. Awesome. Arnold plays Dutch, the leader of a special forces unit that is brought in under the guise of rescuing some political hostages in the imaginary Latin American country Val Verde (conveniently enough the same country that Arnold was supposed to kill the president of in Commando). His unit is composed of Mac (Bill Duke), Billy (Sonny Landham) (both of whom were also in Commando), Poncho (Richard Chaves), Blain (Jesse Ventura) and Hawkins (writer/director Shane Black – Iron Man 3, Kiss Kiss Bang Bang). Tagging along, overseeing the mission is Dillon (Carl Weathers). Unfortunately, they quickly turn from the hunters to the hunted, as a 7 foot tall alien, outfitted with all manner of weapons, begins to stalk them through the jungle. Hunting humans for sport. 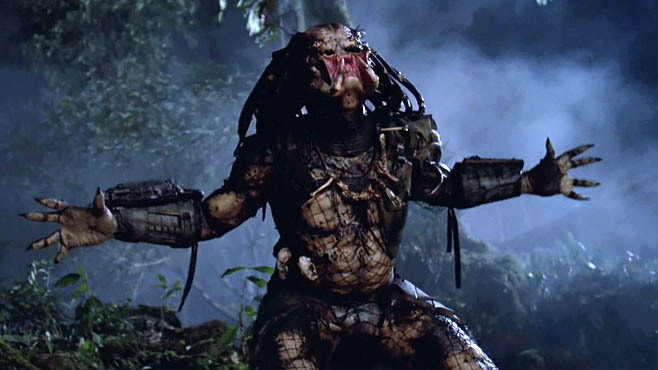 An awesome creation by the sorely missed, and much loved Stan Winston. Quickly, violently, and with a great deal of blood, each member of the team is slowly picked off, until Dutch is left alone to battle this creature to the death in a contest of wills and strength. 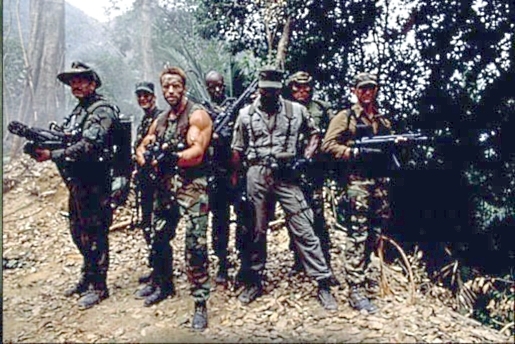 It would have been easy for this film to be cheesy, goofy, and laughable, but bringing in the adrenaline-charge of putting all these big tough guys on the screen, and then watching them all fall to the Predator’s attacks, it’s actually a little frightening. In fact there seems little hope, until Dutch, quite by accident, learns a way around the Predator’s heat sensitive vision. Then it’s on, as not only brawn is brought into it, but brains as well. Arnold made quite a name for himself in the 80s, and more than often made good career choices as well, as Predator, Commando, Conan and the Terminator films demonstrate (well, maybe not Conan The Destroyer), and they have constantly proven themselves worthy of revsiting. 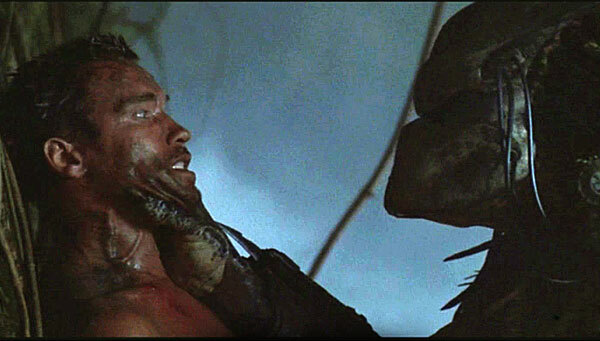 Predator is probably one of my fave Arnold films, as well as one of my fave McTiernan films. The score by Alan Silvestri always puts me in the right mindset anytime I sit down to watch it, and it never ceases to entertain, this is just a fun flick!